I didn’t need much…I didn’t spend much. But I got everything I wanted. Let’s see….there’s some toile tissue paper and some black and cream diamond tissue paper…I had to have them to make some paper cloth with. If you don’t know what that is…see the tutorial on my sidebar. Someone was getting rid of their Smooch spritzes very cheaply,and I had planned to give them a try, so I purchased a few of them. These are paint in a little spray bottle. They will be great to do a spray background on cloth or paper and to spray on stencil designs. When I get a few done I’ll show ya’. Base extender from ProChem. This is so that I can work with some water soluble media on screens. The base extender will seal the designs once they are down. This is what Kerr Grabowski uses, so I wanted to try that. 1/2 yard of a Civil War reproduction print. It’s for my stash because I still have Civil War quilts to make…someday. Susan Spineto split this yard with me. Distress Ink…always fun and in a color I didn’t have. I like to crumple paper and rub this across the peaks of the crumples. Fun. 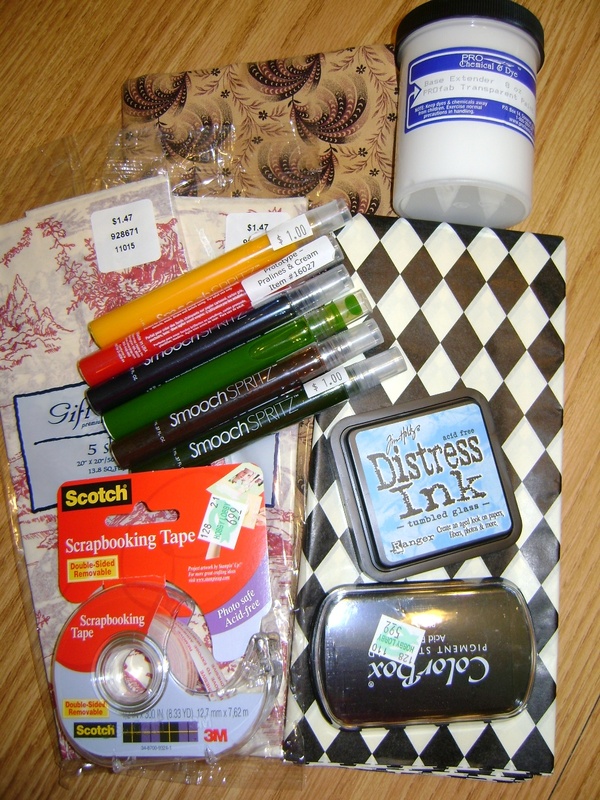 One black ink pad…because I need one and the archival scrapbooking tape. I ran out of this stuff since I’ve been mounting my small series called “Flow” onto some Bristol board backing. I can’t buy this stuff in Carmi, so I have to look for it when I am away from home shopping. I did purchase some wholesale items for my business. Lots of stencils from Embellishment Village and a couple of new stamps that I have some ideas to use with Angelina fibers. Look for samples later on after I have time to play with them a bit. The stencils are for sale…they are 6 inch stencils and they are $4.40 each. Because of the rising river waters, the quilt show was taken out of its usual place at the Expo and Convention Centers. It was split up in various locations in town. We had no problem getting to any of the places and finding parking. The AQS team did a great job because as I understand it, the decision to move the show was pretty last minute. They had a lot of scrambling to do. But it was a great time for us as usual. I’ve been to the AQS quilt show at Paducah, KY this week. On Tuesday, I drove down and met up with friends from back home. We hit Hancock’s, then went to Eleanor Burns, then to downtown. 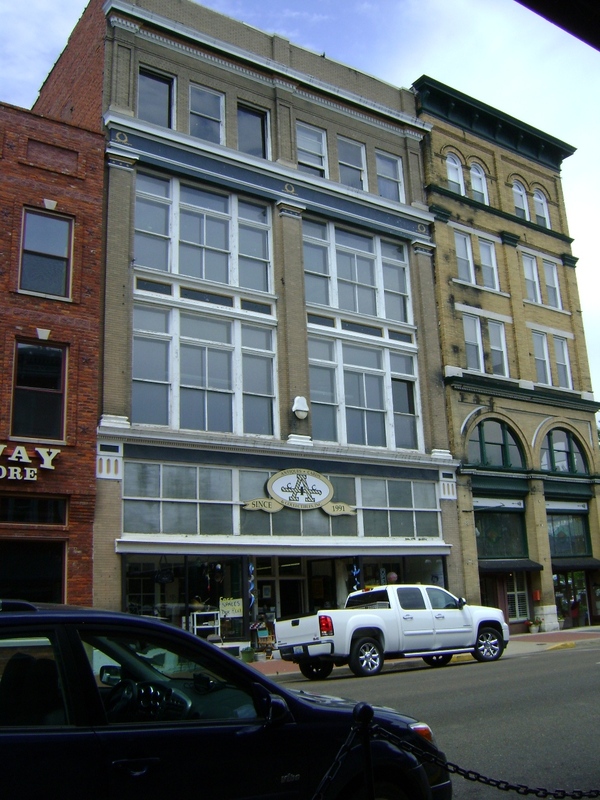 My friends, Betty and Steve Cummings from the Village Mercantile quilt shop in Boonville, IN were vending in the downtown area. I hung out with them a bit and saw the fiber art show across the street at the Yeiser Art Center. We spent the night at Drury Inn and Suites which graciously provided us with dinner of pizza and salad, baked potatoes with the trimmings, nacho chips and drinks, as well as breakfast the next morning. It’s a great place to stay. Wednesday morning we left for the quilt show. The one major thing I noticed about the show was the extremely high quality of a lot of the quilts. I think this year, the competition must have been much stiffer to get in, just because there were so many high quality quilts. I roamed through the vendors, finally finding the ones I really needed to find (that would be Pro-Chem for dyes). In the afternoon, I went to the Embellishment Village booth and worked for Greg and Betty Blais, doing Angelina demos. Met up with my friends for a great Mexican dinner and then found my new “hotel” for the night, staying with a very nice couple for the night. I then worked again for Embellishment Village on Thursday and came home that night. I didn’t buy much. My work for Embellishment Village paid for a few things I wanted to stock up on for my own booth. 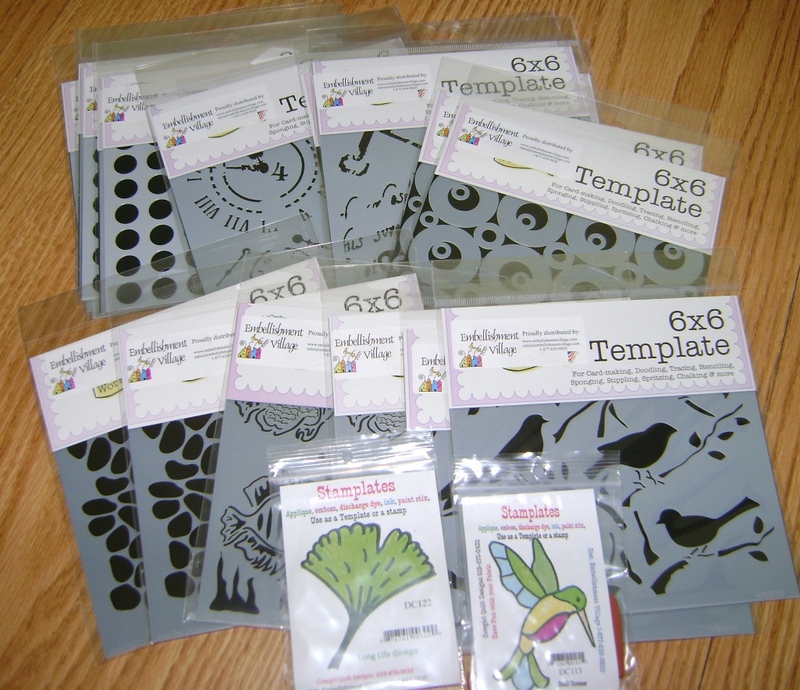 I got some new Botanicals stencils, new Angelina colors, the new Happy Holidays rubbing plates from Cedar Canyon Textiles. I also stocked up on glitter towers and foiling glue and patterns. 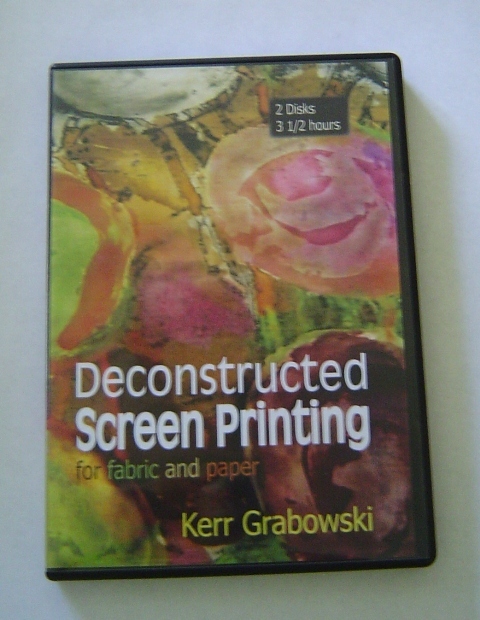 For myself, I purchased Kerr Grabowski’s dvd on Deconstructed Screen Printing. After watching it yesterday, I am anxious to get to work! 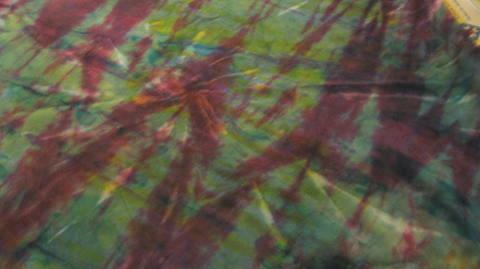 This morning I am working on printing silk scarves. It feels good to be getting back in the creative mode! I purchased the fabric for this sample last Saturday. Now I will need to sell the class to recoup my costs. Anyway, I decided to work on what was in front of me to hopefully start the juices flowing. 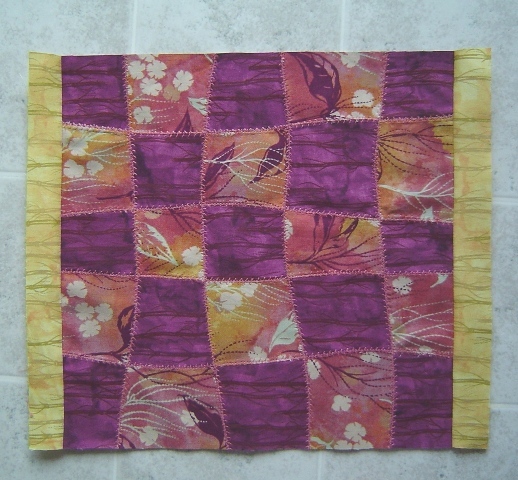 Here is the block and the fabrics I am using. I bought 4 fabrics for the blocks, which will alternate and the sashing and border will be the yellow fabric. The blocks are woven. 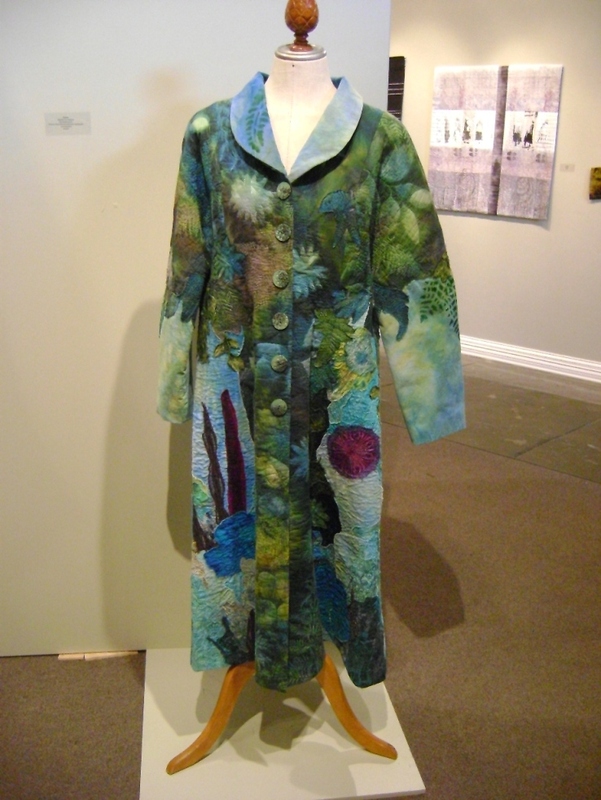 The collection of fabrics is called Serenity and is by Don Baker (?) it looks like (it’s hard to read). Clothworks makes it. I liked making the block and writing down notes for the class….but I don’t feel the juices flowing yet. It was good to be sewing and experimenting again, though. I have read one suggestion to “just show up”. I guess I could try that. But today I think I will read an article in the new QA magazine by Jane Davila…called “it’s About Time”. BTW I will be putting in some work time at the Paducah quilt show on April 21 and 22 (that’s Wed/Thurs). I will be working for Betty Blais at the Embellishment Village booth. Come by and see us! 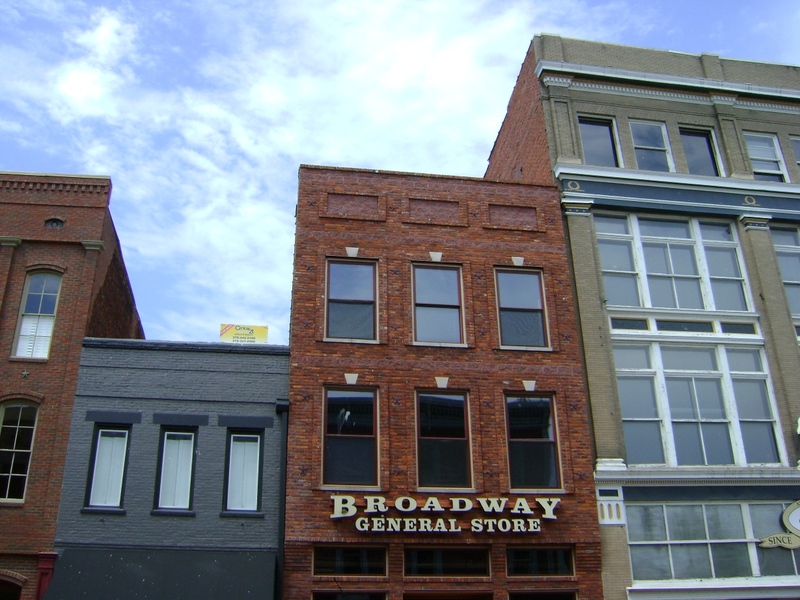 I’m back from Paducah…and it was a great trip. ! saw friends from other places, did lots of walking and shopping, and spent too much. I ran into Kathy Arnett again working for Embellishment Village. The last time I posted about meeting her, I didn’t know that she had a fabulous website that tells about the retreat she organizes every year, so here it is…www.fabricationsretreat.com. Be sure to check it out! 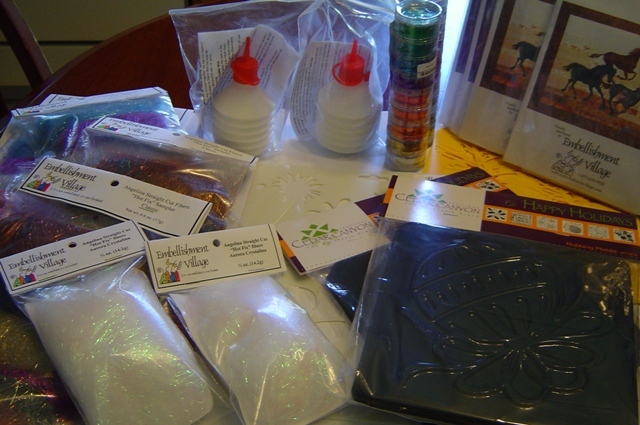 I purchased all the fun stuff…ceramic beads, dyes, paints, etc. I did buy some commercial fabrics that I thought I would cut the motifs from and use in something and some stripes. I also got some great cinnamon colored solids that I will put some surface design on. I also found some newsprint fabric and tape measure fabric. There were new vendors on ParkAvenue across from Bluegrass Honda—good stuff there! 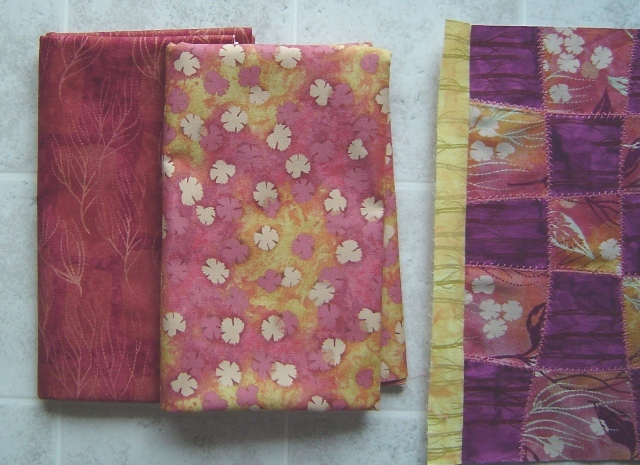 A really great hand dyer with wonderful shibori pieces. 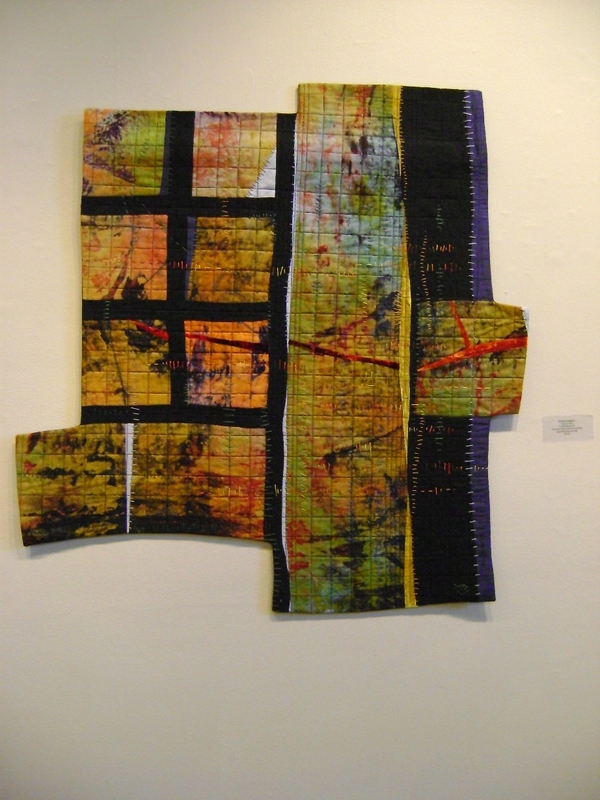 A wonderful “black/white and one other color” challenge was hung in there as well as two solo quilt exhibits. Of course, the quilts at the show were great as usual. It was interesting listening to people comment about certain ones. One comment was that one person “cheated” by painting ovals on her quilt instead of appliqueing them. (Of course, I loved it.) Others were surprised at the choice of Best of Show. There were several whole cloth quilted pieces that had been painted or inked after the quilting, and I thought they were quite stunning. I was hoping I would find some Adirondack Dabbers for sale there, but was unable to locate them. I did find some Adirondack paints in these yummy colors…Butterscotch, Raisin, Denim, Terra Cotta, Eggplant and Bottie..and the price was VERY good. I have some little wooden daubers I can use with them. I probably can’t say enough about our stay at the Drury Inn and Suites. They provided a wonderful dinner and breakfast for us. It was awesome. And of course, to get to spend the time with good friends from back home is totally awesome too. Now that all of my running around is done, I can get back to “normal life”. I have a baby quilt waiting for me to finish quilting, then I have an art festival next weekend. I am looking forward to that and hoping it won’t be hot or rainy. I’m not asking for much, eh?